Description Printed in colour. Size 32cm x 39cm (12" x 15"). 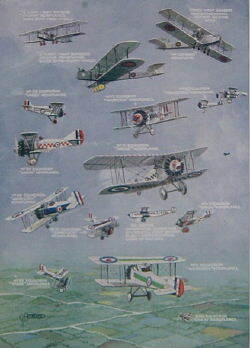 Planes depicted are Siskin aeroplanes, Woodcock aeroplanes, Grebe aeroplanes, Gamecock aeroplanes, 20 seater commercial aeroplane, Viginia aeroplanes & Hyderabad aeroplane.